or the serious Brother Cadfael fan's collection to be complete, this Series Soundtrack is a must. The music, composed, arranged, and produced by Colin Towns (there are a couple of tracks that are not his compositions), is taken directly from the series and has all the color and flavor of a medieval town. From the opening theme, through gregorian chants, faire music, to the end theme, the music "IS" Brother Cadfael. In fact, I personally enjoy it so much that I have a copy of the CD in my CD Alarm Clock, and every morning I am awakened by the Opening Chant of the Brother Cadfael series. I never tire of it, and often, now that I know it by heart, I can lie in bed, dozinig, and know exactly what time it is by the track that is playing. Thus, I know that I can either doze some more, or get up and get ready for work. *SPECIAL NOTE ON THE BROTHER CADFAEL SOUNDTRACK: Thanks to information sent to me by visitor Mark Ritchie, The Cadfael Soundtrack is again available to everyone. Believe me, it is well worth the purchase price, which incidently is comparable to most CD albums. The sound track is now available from ArkivMusic. You can order the soundtrack by clicking here, and can be purchased for the very reasonalbe price of $16.99. 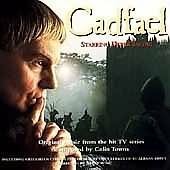 If you are true Cadfael fan, get this one. It is well worth the price, and I promise you will not be disappointed. This page last updated on July 27, 2012.